NASA's Wide-field Infrared Survey Explorer, or WISE, took this last snapshot of the sky on the morning of Feb. 1, 2011. It shows a region in the constellation Perseus about three times the size of the full moon. A sky-mapping telescope that spent 13 months cataloging cosmic objects as it roamed through space took one last photo of the sky this month before shutting down for good. NASA's Wide-field Infrared Survey Explorer, called WISE, captured this last snapshot of a patch of our Milky Way galaxy as the spacecraft ended its successful survey mission. The image shows thousands of stars covering an area three times the size of the full moon. This swath of the sky is located in the constellation Perseus. In the upper left corner, a faint wispy cloud can be seen bending around a pulsating star called EV Persei. During its brief 13 months in operation, WISE scanned the sky 1 1/2 times, taking about 1.8 million images of asteroids, stars and galaxies. The spacecraft spotted 19 previously unseen comets and more than 33,500 asteroids, including 120 near-Earth objects, which are objects with orbits that pass relatively close to Earth's own orbit around the sun. Some scientists hope that the sky maps created by WISE will help determine whether a giant planet called Tyche actually exists on the edge of the solar system. Because the object, which theorists suggest could be four times the mass of Jupiter, is so far away and so cold, the infrared WISE observations may be the best bet to find it, one research team suggests. In October 2010, WISE ran out of the coolant needed to chill its infrared detectors. The spacecraft warmed up from minus 436 degrees Fahrenheit (minus 260 degrees Celsius) to minus 328 F (minus 200 C). As WISE's instruments warmed, two of the observatory's four detectors stopped operating. This image contains data from the two other detectors, which were largely unaffected by the higher temperatures. 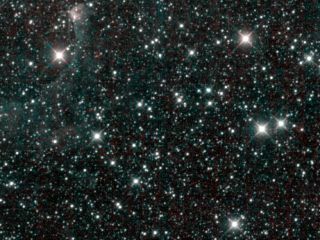 This photographed region of the sky had previously been observed by WISE using all four detectors as part of the mission's primary survey. There is no noticeable difference in the quality between the spacecraft's first image and this one. Now that the survey is complete, WISE has been put into hibernation. While the satellite sleeps and circles more than 500 kilometers (about 310 miles) above Earth, the WISE team is busy preparing the data for two public releases: one in April, and a final release in the spring of 2012.